Running and the Runner’s High: Truth, or Myth? Many of us have experienced running, either in the most glorious of times or in the worst of times. Running helps us get to places on time if we are late, it sometimes makes us feel better, and it overall seems to have positive effects on our lives. Running can also be negatively viewed, being torturous exercise on the legs and body, hard on the knees, and does not always feel so good! After examining a WebMD article, it states that while endorphins and the natural release of dopamine plays a slight role in this “high” feeling, the rhythmic aspect and duration of the run plays a larger role. Probably the biggest factor the author noted was the repetition of exercise. Chief science officer Cedric Bryant (PhD for the American Council on Exercise) states that by repeating running (or any other aerobic exercise) on a normal basis, you can perform in a repetitive rhythmic fashion, and that seems to produce the “high” effect. Overall, we can conclude that runner’s high is not necessarily a drug but more so the ACT of repeating physical movement on a standard basis. 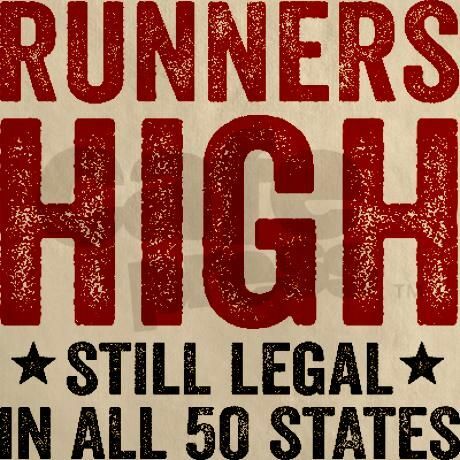 Be good to yourself and get your runner’s high today! Weather in Seattle is looking ideal for the next 10 days (cloudy, cool(er)) to be outisde– so get out and have fun!